Looking for the perfect grab and go breakfast or snack ideas? 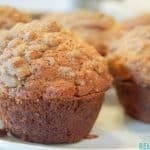 These banana bread muffins are a delicious, moist, sweet muffin with the perfect amount of banana flavor, topped with a glorious sugar crumb topping. This banana bread recipe will become an instant family favorite. Follow my tips and tricks below to make the perfect muffins. To make this recipe you will need: all-purpose flour, brown sugar, sugar, one egg, three ripe bananas, baking powder, baking soda, cinnamon, and salt. Hi there! My name is Jennie and I blog over at The Diary of a Real Housewife. I have a really yummy and easy banana bread muffin recipe to share with you today. Would you believe me if I told you that my 4-year-old ate six of these banana bread muffins? Yep, six. I’m not sure where he puts them. He is a growing boy for sure, and when he hits those growth spurts, there is no stopping him! I can’t blame him, though, because these banana bread muffins really are that good. They are great to make in big batches to freeze for a quick breakfast or after school snack. I feel like we always have leftover bananas. Even though we all love bananas and eat them regularly, sometimes a few still slip through the cracks and turn brown. 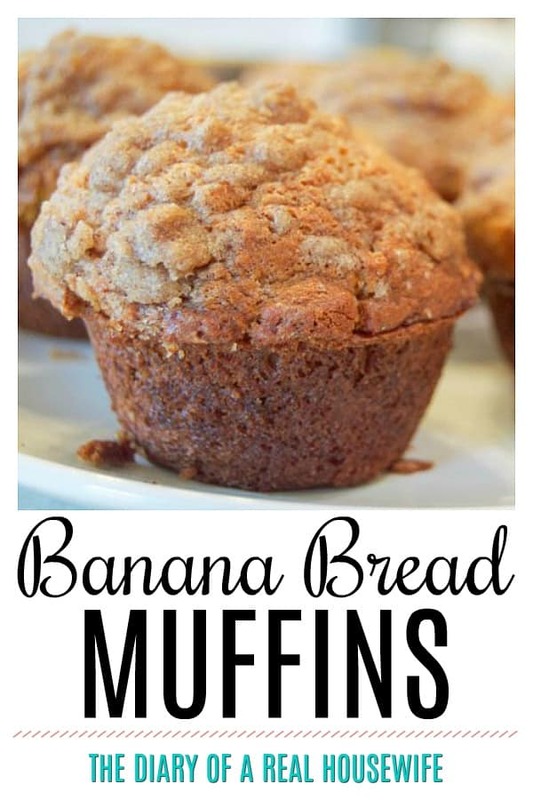 I’ve made so many different muffins using bananas, and so far these banana bread ones have to be my favorite. It is easy to see why these have become so popular with the family. 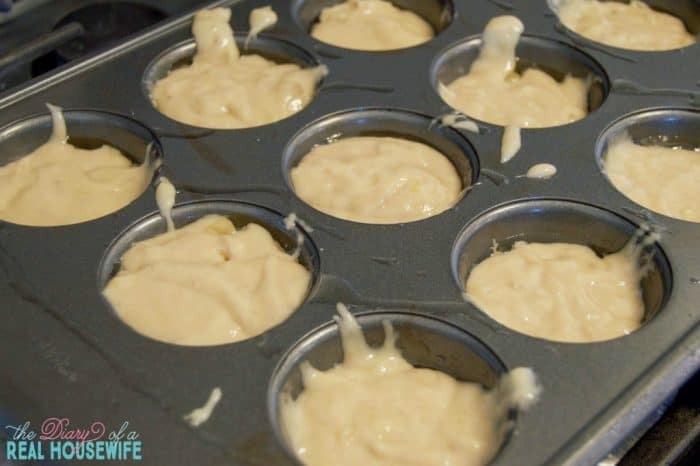 They are easy to put together and bake, and there is just nothing like warm, delicious muffins right out of the oven with a little melted butter. Yum. Add all your dry ingredients into a mixing bowl and mix well together. In a separate large bowl (large enough you could whisk or use a hand mixer) or in your stand mixer, mix together wet ingredients. Once both are mixed separately, add the dry ingredients to the wet ingredients, and keep on mixing until the banana bread muffin batter is just combined. Don’t over mix these, or they won’t be as light and fluffy. Fill muffin pan slots about 3/4 of the way up with batter. You don’t have to line the muffin tins since they come out pretty easily without them, but it doesn’t hurt if you do want to line them. After that, it is time to top the batter with the good stuff, and by good stuff, you should know that I mean butter and sugar. In a small bowl, mix up the brown sugar and butter crumb topping using a fork, and place a spoonful (or more) on each banana bread muffin. You are ready to bake and then enjoy this simple recipe. Make a batch and freeze the extra to defrost later in the week for breakfast or an after school snack. Add chocolate chips to make them a bit sweeter. Everyone needs chocolate for breakfast! Turn this recipe into a banana bread by using a bread pan rather than a muffin pan. To help ripen bananas that are not quite brown enough, place them in a brown paper bag and close loosely. You can also brown bananas by placing them on a baking sheet and putting them in an oven at 300 degrees for 40 minutes. Once the skin is black they are browned and ready to be used in this banana bread recipe. I usually end up making my muffins the night before since I have toddlers that don’t like waiting for food. But a few mornings ago, I decided to make these again for the boys. They are so easy to put together and bake, I didn’t have to worry about getting up extra early or making them the night before. Unfortunately, they are so good they don’t last long in our house! Hope you enjoy these as much as our family does! Banana bread muffins are an easy way to use brown bananas and create a breakfast that your entire family will gobble up. Plus, the brown sugar topping makes them that much tastier, and add a little crunch. Looking for the perfect grab and go breakfast or snack ideas? 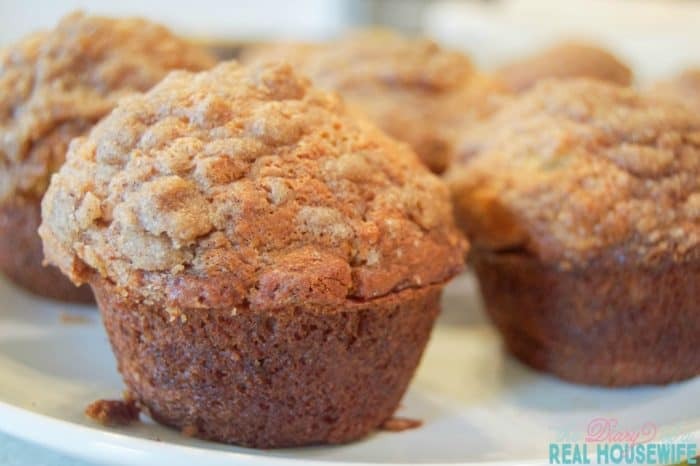 These banana bread muffins are a delicious, moist, sweet muffin with the perfect amount of banana flavor, topped with a glorious sugar crumb topping. Preheat oven to 350 degrees F. Lightly grease muffin tin with oil. Mix together flour, salt, baking powder, and baking soda together. 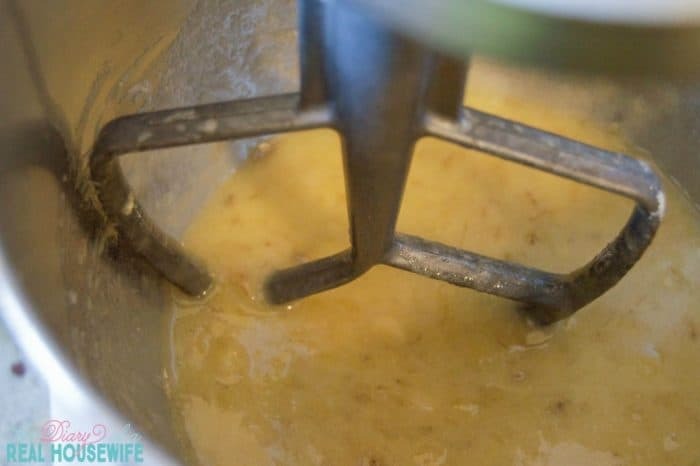 In a separate bowl or stand mixer beat together bananas, egg, melted butter, and sugar. Slowly add your flour mix into your banana mix. 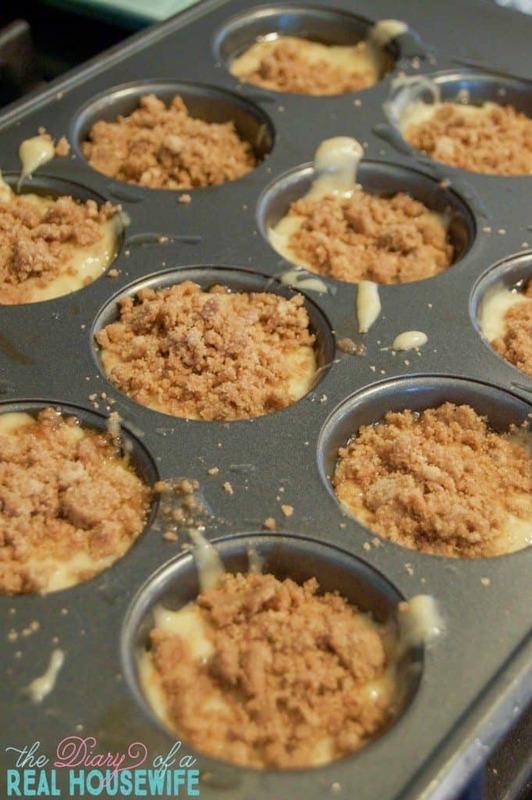 Mix until combined and then spoon into prepared muffin tin. In a small bowl add flour, cinnamon, brown sugar, and butter. Use a fork to mix together. It should end up looking like crumbles. Add these on top of your muffins before baking. Bake for 17-19 minutes or until a toothpick comes out clean after being inserted into the muffin. If you liked this recipe, make sure to stop by and check out more! Also, as a special thanks for stopping by, I wanted to give you my family dinner e-books FREE! Just sign up below and it will be emailed right to you. I’m baking these now. Thanks for the recipe, much easier to follow than some of the others that I have found. I used brown sugar instead of white sugar, so fingers crossed they turn out okay. Just made these muffins this morning. They turned out delicious! Here’s my result of my very first time cooking muffins. I noticed I was missing a step, and it was putting the brown sugar on top. I was going to post a pic, but doing it this way, it won’t let me. The butter was added in the mix instead of on top… Ouppsssss They are excellent. I feel the recipe should have a distinction between muffin ingredients and the ingredients for the toppings as my child was making the recipe and was going to mistake the bottom of your list for the muffin mix. Made these yesterday and they were so delicious! Thanks! I made the banana bread muffins and they are absolutely delicious. One question… can I turn this recipe into a loaf instead of muffins?